Pascal Le Segretain/Getty Images; GAB Archive/RedfernsAlmost from the start, it’s seemed as if you can’t even mention the upcoming Nina Simone biopic, Nina, without someone criticizing it. The latest jab comes from the estate of the late singer herself. 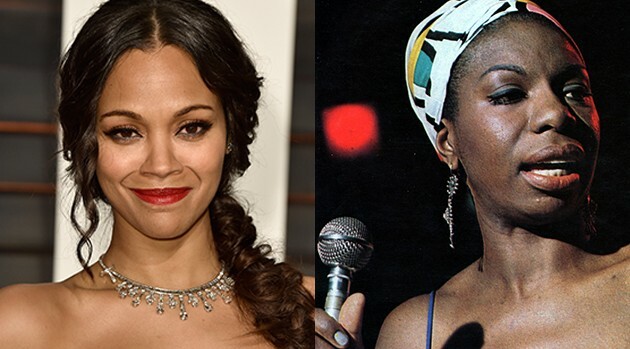 Nina star Zoe Saldana tweeted Tuesday, “I’ll tell you what freedom is to me – No Fear… I mean really, no fear.” #NinaSimone.” That Simone quote drew this blunt response Wednesday from Simone’s official Twitter account: “@zoesaldana Cool story but please take Nina’s name out your mouth. For the rest of your life.” It’s unclear who runs that account. That controversy intensified when photos of Saldana on the set showed her with a prosthetic nose, her skin darkened with makeup. Things didn’t get better when Entertainment Weekly earlier this week posted a photo of the first poster for Nina, revealing the same. Saldana’s physical transformation is more apparent than before in the new trailer for Nina, which dropped Wednesday. With the makeup, her accent and her wardrobe, the actress is nearly unrecognizable. It remains to be seen whether audiences and fans will be able to look past the controversy and judge Saldana for her performance alone. We’ll find out soon — Nina finally opens April 22. Simone, who died in 2003, iss the subject of the critically acclaimed Netflix documentary, What Happened Miss Simone?, which was nominated for an Academy Award for Best Documentary. It lost last Sunday to a film about another late singer — the Amy Winehouse documentary, Amy.